Twenty-one of the 32 champs since 1985 (including the past four: UConn, Duke, Villanova and UNC) have donned blue. Since the NCAA tournament expanded to 64 teams in 1985, 295 schools have taken part in March Madness. 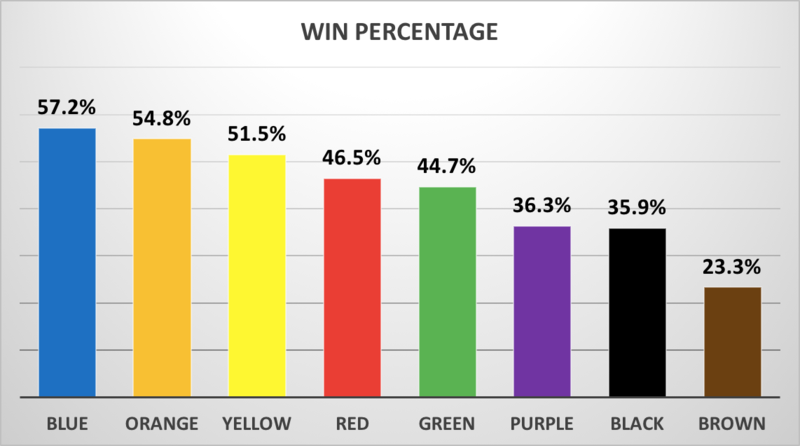 We decided to take a deep look at the one of the most talked about, if not necessarily the most important factor in determining a team's chances: school colors. In the more than 2,000 tournament games played since 1985 (not including the First Four), here’s what we learned. 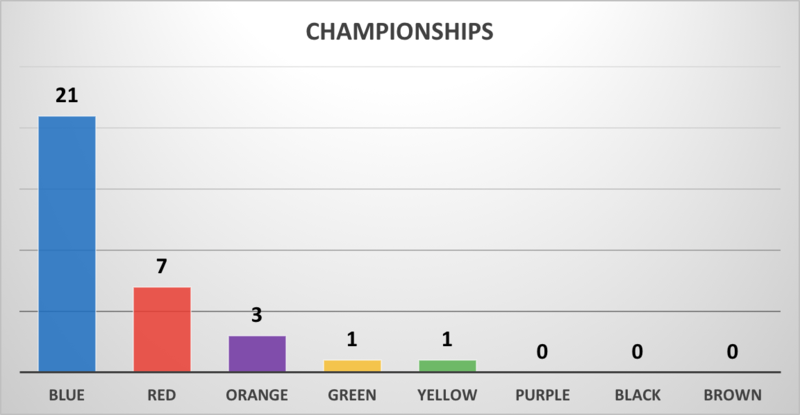 Only three colors have winning records in the tournament: blue, orange and yellow (which includes gold). Nota Bene: These statistics only count games against other types in the category, e.g., red vs. red games are not taken into account. Of course, some of this is skewed by the number of teams each color has and how many games those teams have played. Blue, for instance, has the second-highest number of teams, and has played the most NCAA tournament games since 1985 by far (1,362). Brown, on the other hand, has only six teams and has played only 30 tournament games. 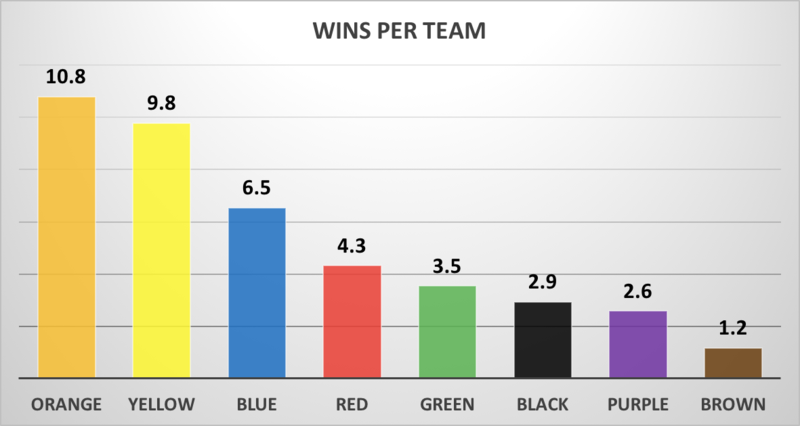 But looking at each color’s wins per number of teams doesn’t tell too much of a different story, as the top three colors stay the same. In the 32 years since the NCAA tournament's expansion, the most common matchup isn't too surprising: red and blue teams have played each other 483 times, and blue holds a 281-202 lead in the series. In fact, blue holds a winning record against every color except orange. What’s more, in the 33 championship games since the field expanded to 64 teams, blue teams have won 21 titles (Duke 1991, 1992, 2001, 2010, 2015; Connecticut 1999, 2004, 2011, 2014; Kentucky 1996, 1998, 2012; North Carolina 1993, 2005, 2009, 2017; Kansas 1988, 2008; Villanova 1985, 2016; UCLA 1995). The next closest color is red with seven championships (Louisville 1986, 2013; Arizona 1997; Arkansas 1994; Indiana 1987; Maryland 2002; UNLV 1990). Orange has three (Florida 2006, 2007; Syracuse 2003), and Green (Michigan State 2000) and Yellow (Michigan 1989) each have one. It’s simple. If a team’s color is the most important factor for you in picking a game -- seems perfectly logical to us -- run with the blues.